Flew out of Binghamton on Saturday night via US Airways. Through Philadelphia and then into Atlanta. Stayed at the Econo Lodge on Virginia Ave near the airport on Saturday night (scary hotel!). Jill flew into Atlanta on Sunday, and we headed off to the Atlanta Marriot Marquis where we stayed for the rest of the trip. Convention was held in the Georgia World Congress Center. Jill was voted onto the AAPC National Advisory Board, and there was a luncheon on Wednesday afternoon where the new advisory board members were recognized. We ate dinner one night at Emeril's Atlanta, making it the second Emerils restaraunt that we have gone to. 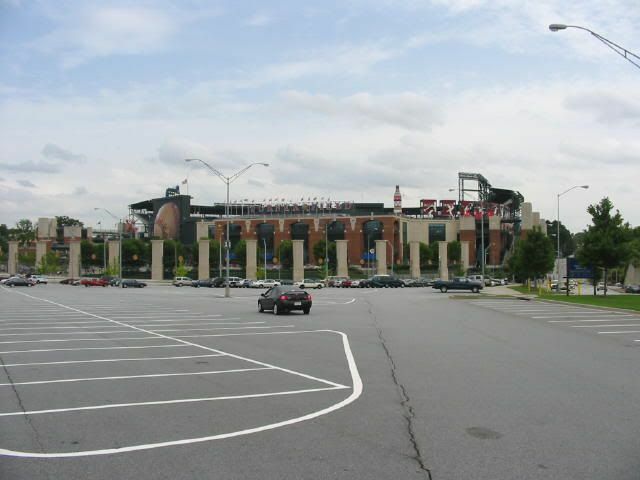 Tim toured Turner Field, as well as CNN and the Georgia Dome. Attended the baseball game on Wednesday night, and then headed home on Thursday. a-popped out to shortstop for D Wheeler in the 6th; b-hit by pitch for J Franco in the 7th; c-reached on infield single to shortstop for R Gutierrez in the 8th. BATTING: 2B - M Piazza (1, C Reitsma). HR - M Piazza 2 (3, 1st inning off M Hampton 1 on, 2 Out, 7th inning off C Nitkowski 0 on, 0 Out), M Cameron (1, 1st inning off M Hampton 0 on, 2 Out), K Garcia (1, 9th inning off J Smoltz 1 on, 1 Out). SF - M Cameron. RBI - M Piazza 4 (5), M Cameron 2 (2), C Floyd (1), K Garcia 2 (2). 2-out RBI - M Piazza 3, M Cameron, C Floyd. Runners left in scoring position, 2 out - M Cameron 1, R Gutierrez 1, J Phillips 1, K Matsui 2. GIDP - M Cameron, C Floyd. Team LOB - 10.
a-singled to left for M Hampton in the 4th; b-flied out to right for A Alfonseca in the 6th; c-singled to left for C Reitsma in the 8th. BATTING: 2B - M Giles (1, S Trachsel); A LaRoche (1, G Roberts); M Derosa (1, D Wheeler); C Jones (1, O Moreno); A Jones (1, O Moreno). HR - C Jones (1, 3rd inning off S Trachsel 1 on, 2 Out). S - M Hampton. SF - M Giles 2. RBI - M Giles 3 (5), C Jones 2 (2), J Estrada 2 (2), J Franco 3 (3), J Drew 2 (2), A LaRoche 2 (2), M Derosa (1), A Jones 2 (2), R Furcal (1). 2-out RBI - M Giles, C Jones 2, A LaRoche 2, J Estrada, M Derosa, J Franco, A Jones 2. Runners left in scoring position, 2 out - A LaRoche 1, J Drew 2. Team LOB - 7. FIELDING: E - R Furcal (2, throw); M Giles (1, ground ball). DP: 2 (M Derosa-M Giles-A LaRoche, R Furcal-M Giles-A LaRoche). S Trachsel pitched to 5 batters in the 4th. IBB - C Jones (by G Roberts). BALK - M Hampton. HBP - V Wilson (by C Nitkowski). Pitches-strikes: S Trachsel 62-43; G Roberts 22-9; D Wheeler 28-16; J Franco 17-10; O Moreno 18-11; M Stanton 26-16; M Hampton 90-53; K Gryboski 15-9; A Alfonseca 14-6; C Nitkowski 29-16; C Reitsma 23-15; J Smoltz 16-13. Ground balls-fly balls: S Trachsel 5-2; G Roberts 0-2; D Wheeler 0-2; J Franco 2-1; O Moreno 2-1; M Stanton 0-2; M Hampton 5-5; K Gryboski 0-2; A Alfonseca 2-1; C Nitkowski 1-0; C Reitsma 2-1; J Smoltz 1-0. Batters faced: S Trachsel 18; G Roberts 7; D Wheeler 7; J Franco 4; O Moreno 6; M Stanton 7; M Hampton 23; K Gryboski 3; A Alfonseca 4; C Nitkowski 6; C Reitsma 6; J Smoltz 5. UMPIRES: HP--Angel Hernandez. 1B--Darren Spagnardi. 2B--Matt Hollowell. 3B--Larry Young. T--3:29. Att--22,775. Weather: 72 degrees, clear. Wind: 7 mph, out to center. ATLANTA (Ticker) -- Even without Gary Sheffield and Javy Lopez, the Atlanta Braves proved they still can put up some numbers. Rookie Adam LaRoche, Johnny Estrada and Julio Franco combined for six hits and seven RBI in an 11-run fourth inning as the Braves rolled to an 18-10 victory over the New York Mets. The 18 runs is the most in a game by the Braves since a 20-3 rout of Florida on October 5, 2001. New York's Mike Piazza went 5-for-5 and hit a pair of homers to move within one of tying Carlton Fisk for the career record of 351 by a catcher. His two-run homer in the first inning and RBI single in the second helped the Mets build a 6-0 lead. But Steve Trachsel (0-1) gave it all away before he was yanked in the fourth inning. 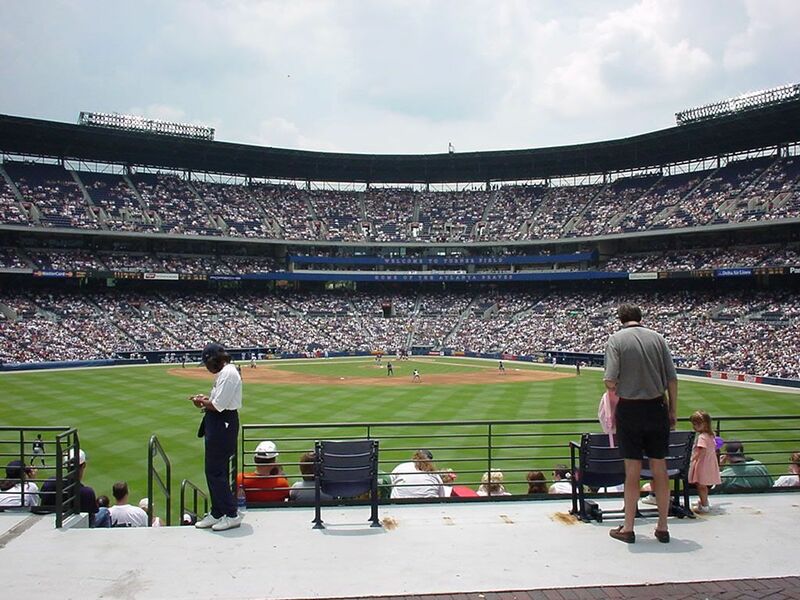 An RBI single by Marcus Giles and a two-run homer by Chipper Jones in the third inning pulled the Braves within 6-3 before they erupted for nine hits and sent 15 men to the plate in the fourth. Andruw Jones led off with a base hit and LaRoche followed with a single for his first major league hit. Estrada singled home Andruw Jones and Mark DeRosa walked to load the bases before Franco tied the game with a two-run single. "I was just feeling like I was one pitch away," said Trachsel, who was 10-1 on the road last season. "It didn't stop. It was really kind of ugly all the way around for the pitchers tonight." Grant Roberts relieved and yielded a sacrifice fly to Giles and a two-run single to J.D. Drew, giving the Braves a 9-6 lead. In his second at-bat of the inning, LaRoche delivered a two-run double and scored on a single by Estrada. DeRosa doubled home Estrada and Franco capped the inning with an RBI single. "It's nice to get it (first hit) off my back," LaRoche said. "An 11-run inning, I don't remember an 11-run inning in college or high school. It's pretty cool." "When have you seen someone get his first two major league hits in the same inning," said Giles, who had three hits and three RBI. "He knows how to play the game. I'm very happy for him." Kevin Gryboski (1-0) tossed a scoreless inning in relief and got credit for the win after starter Mike Hampton couldn't make it to the fifth. Piazza's second home run was a mammoth 456-foot shot to center in the seventh inning - the second longest ever hit at Turner Field. It was also the 361st home run of his career, tying him with Joe DiMaggio for 58th place on the all-time list. "I guess it's significant because we're both Italian," Piazza said. "Obviously, it means a lot to my dad because he's a big DiMaggio fan. When they told me, I was like, 'Wow.' It's great company, I'm honored." Mike Cameron homered and drove in two runs and Karim Garcia hit a two-run homer for the Mets. After getting a homer and two doubles with three RBI in his Mets debut Tuesday, Kaz Matsui went 1-for-4 with two walks.